You are not logged in. [Log In] Pond Boss » Forums » AERATION » Systems questions » Figuring flow rate between pump & diffuser discs? 21 registered (Jtparker779, canyoncreek, wbuffetjr, NEDOC, blkandst, bobbyc, Zep, Dave Davidson1, blavis, Bocomo, Snicholas, SamBC, travlinman, roundy, GAPRanch, Chris Steelman, Spicelanebass, one more cast, RStringer, Snipe, Augie), 243 Guests and 587 Spiders online. #434204 - 01/11/16 02:57 PM Figuring flow rate between pump & diffuser discs? I am trying to figure out how many discs to buy from these guys. I am going to match it either a GAST or THOMAS pump. The website for the discs says check technical data page but there is none. So I called them and they emailed me a PDF file which I am going to attempt to post in this thread. I really dont understand the numbers or how they transition to the PUMP CFM? Here are the numbers for the 9" and 12 " discs. Im looking at a couple of kits/ pumps on ebay. *115 Volt AC, "Continuous Duty Rated Rebuilt Thomas Industries Pump: 400 Watt, 1/3hp with approx. 4cfm output. Draws just 3.5 - 4 amps (depending on exact depth of your pond). Rebuilt Thomas pumps do vary slightly in style, condition, appearance, etc. Output Specs will all be the same & They are all backed by a FULL 1 YEAR Warranty directly from us! We also service units we sell after the warranty period too, we can keep you up and running for many years at low cost! Too hard for me to read the small chart, but it looks like the 9" is designed to properly operate at anything between 1.5 and 3 cfm air flow. So all you have to do is match your pump output to your air flow. Your pump is rated at 4 cfm but it does not say at what pressure. Lets say, just for example purposes, if the pump is 4cfm at 0 psi but at a 10' depth (5 psi back pressure) it is 3 cfm. Then at a ten ft depth you could use a single 9". Or if it is say 3.5 cfm for the pump output at the depth you want to run it, you could either use 2 - 9" diffusers or a single 12". You just have to know what your pump output is at the depth it will be running (roughly .5 psi for every foot of water depth) and match the diffuser(s) to what air you have available. Another way if you have too much air would be to have a bleed off valve and waste some of the air but that is not preferred because you are just burning electricity to waste pumped air. I would rather run it through another or a bigger diffuser. If your pond is circular and a single diffuser would work well, a single 12" might be fine. But if it is kidney shape or some other irregular shape with deep points at different places, the two 9" diffusers in separate places might give better water turn over. Remember, the purpose of the air is not to aerate the water with the bubbles, although it will do a little of that. The purpose of the air is to create a water flow from the bottom up to bring bottom water to the top where the air-water interface is what is causing the water to take on more air. You are actually pumping water with the air and it is the water movement that you want. If those charts that I can't read say it is alright for a certain air flow through the membrane at a certain depth, then go by what is on the chart. You need to know the depth you will be placing the diffuser, and how much cfm your pump puts out at that depth. Then match the diffuser sizing according to what cfm they require/handle at that depth. If you put too much air (more than it is designed for) through a diffuser it likely will shorten its life by ballooning it up and stretching the membrane more than it is designed to be stretched. Pretty much what snrub said. It looks like it takes 1.5 cfm to get the disc to start producing bubbles. So, if the pump produces 4.0 cfm, that would barely get you enough to run two diffusers. Like all things mechanical, pumps will wear over time and be less efficient, so I would feel better starting out with a pump that produces close to the maximum cfm of air that I will need at the psi where the diffusers will be placed. May need to consider that these are waste water style diffusers designed for a much different purpose than what one might run in a pond rig. I'm using a 1/3 hp rotary vane compressor that runs to two airlines and two membrane diffusers, which I'm pretty sure are 9 inch. (1/2 inch air line) Water depth of each diffuser is in 8 to 9 feet of water. 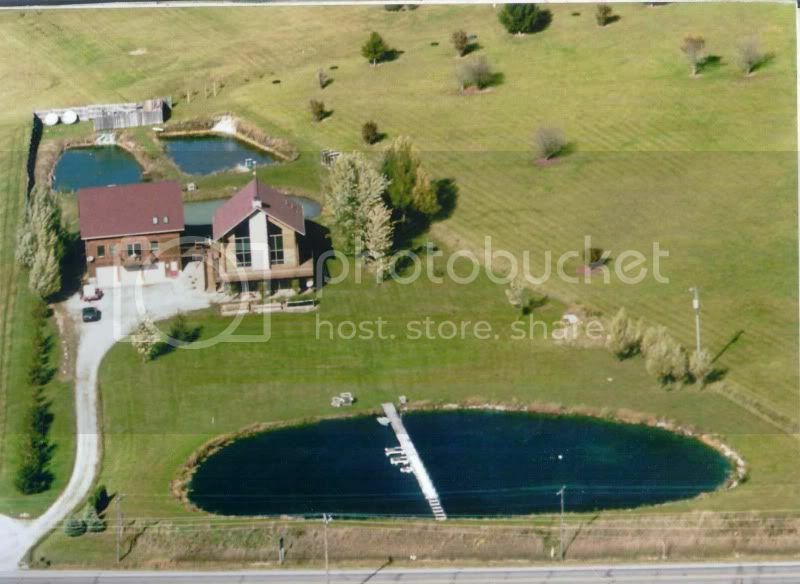 Pond is .62 acres. There seems to be pleny of air for each diffuser and i haven't changed the vanes for three years! so if im correct, then this style starts producing at 0.5? Its a 9 inch! FWIW in my newbie opinion, the one thing that is missing in this discussion is efficiency of the diffuser to convert air CFM to water flow. There are lots of diffusers out there and all convert air flow to water flow a little differently. I would remember what Snrub said, it's all about moving the water from the bottom to the top, not just compressor air flow and the capacity of the diffuser to take it. are these the best price on these? You knows what's interesting? I purchased several 9 inch diffusers from Ebay, Amazon, and Vertex. Except for the color they are all identical including pore size. My guess is they are made by the same manufacturer. Did you ever measure the pore sizes and count numbers? I think that would be kinda tough on the fine bubble rigs, but you can measure them on the medium and coarse diffusers, at least the ones I have. But in the water the diiffuser boils looked very comparable. Lot's of tiny bubbles seem to look the same. Love the sound of my swim spa!